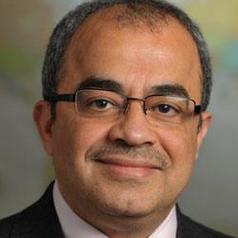 Emad Shahin is a visiting professor of political science at the School of Foreign Service at Georgetown University and the editor-in-chief of The Oxford Encyclopedia of Islam and Politics. He is professor of public policy, The American University in Cairo (on leave). Currently based in the US, Shahin is also a distinguished visiting scholar at Columbia University. His areas of interests include Comparative Politics, Islam and Politics, Political Economy of the Middle East, and Democracy and Political Reform in Muslim societies. Previously, Shahin was a public policy scholar at The Woodrow Wilson International Center for Scholars (February- August 2014). He was the Henry R. Luce Associate Professor of Religion, Conflict and Peacebuilding at the University of Notre Dame’s Kroc Institute for International Peace Studies (2009-2012). He was visiting associate professor in the department of Government at Harvard University (2006-2009), faculty affiliate with the Kennedy School of Government, and visiting scholar in the Islamic Legal Studies Program at Harvard Law School (2006-2007). Shahin holds a Ph.D. (1989) from the Johns Hopkins School of Advanced International Studies, M.A. (1983) and BA (1980) from the American University in Cairo. A prolific author, Shahin authored, co-authored and co-edited six books and has more than 50 scholarly publications including journal articles, book chapters and encyclopedia entries. His publications include Political Ascent: Contemporary Islamic Movements in North Africa (1998), co-editorship with Nathan Brown of The Struggle over Democracy in the Middle East and North Africa (2010); and co-authorship of Islam and Democracy (2005 in Arabic). He is the editor-in-chief of The Oxford Encyclopedia of Islam and Politics (2014) and co-editor with John L. Esposito of The Oxford Handbook of Islam and Politics (2013).